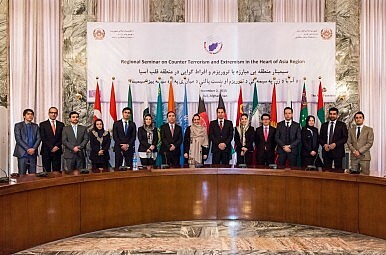 Heart of Asia member country delegates at a seminar on counterterrorism in December 2015. Those “other countries” were not specified in Wang’s remarks, but we got a clear sign of which countries China hopes to work with, thanks to Wang’s meetings on the sidelines of the conference. First, Wang held separate meetings with Afghan President Ashraf Ghani and Pakistani Prime Minister Nawaz Sharif, and expressed his support for the resumption of peace talks. Pakistan is seen as a key partner in the talks, given its relationship with the Taliban, and China has been trying to cajole its “iron brother” into a good faith effort to support Afghan reconciliation. Earlier this year, after the first successful round of Afghan-Taliban talks, there was some cautious optimism that China’s strategy was bearing fruit. But the fragile rapprochement between Afghanistan and Pakistan didn’t last. Terrorist attacks in Kabul, including a July 2015 attack on the Afghan Parliament, led Ghani to adopt a harder stance on Pakistan, which he accused of not doing enough to root out Taliban militants within its border. “We don’t want Pakistan to bring the Taliban to peace talks, but to stop the Taliban’s activities on their soil,” Ghani said. Internal strife among the Taliban after Mullah Omar was confirmed to have been killed two years ago also helped scuttle the peace talks. China wishes the Afghan government could stay in the course of holding peace talks with the Taliban, and China is ready to continue to facilitate and help build a platform for the revival of the reconciliation process. China believes Pakistan can play its unique role in promoting such talks, and the United States, another important player, can also play an active and constructive role in this regard on the basis of respecting the sovereignty of Afghanistan and the will of various factions in the war-torn country. For China, which is struggling to formulate a response to the growing threat global terrorism poses to Beijing’s interests abroad, keeping Afghanistan stable is a top priority. As Ghani noted in remarks at the conference, “terrorists from China, Russia, Uzbekistan, Tajikistan, the Middle East are all, unfortunately, present” in Afghanistan. It’s the “terrorists from China” that are most concerning to Beijing, which fears those militants will seek to carry out attacks on Chinese soil. Instability in Afghanistan, resulting in increased space for terrorist groups to operate on China’s western border, would be a nightmare for Beijing. That’s music to Beijing’s ears, and a sign that Wang’s meetings paid off. The question now is whether this round of rapprochement will last longer than the first – or whether the next terrorist attack in Afghanistan will count the peace talks as one of its casualties.